Russia says it has tested a new nuclear-capable intercontinental ballistic missile; Russian President Vladimir Putin has said the missile can defeat any US missile defences. Putin and President Donald Trump have been squaring off over who has the better nuclear arsenal, with Trump reportedly telling Putin he would beat him in an arms race. Putin and Trump seem on the path toward escalating an arms race that has already produced horrific nuclear devices. The country’s president, Vladimir Putin, has said the missile can defeat any US missile defences amid growing talk of an arms race with the US and President Donald Trump. Putin spent much of his State of the Nation address on March 1 hyping up and showing animations of new nuclear weapons systems Russia was developing. He claimed they could all defeat US missile defences. But an arms race requires two to tango, and Trump has also been vocal about establishing US nuclear supremacy. The US also recently conducted a routine test of its Trident II submarine-launched ballistic missile, which is so accurate that experts fear it may put Russia on edge and actually make it more likely to strike first. And the feeling of nuclear inadequacy may be mutual. Putin’s nuclear chest-thumping “really got under the president’s skin,” according to a White House official cited by NBC News on Thursday. On a recent phone call between the two leaders, which made headlines for Trump’s decision to congratulate Putin on his less-than-democratic reelection, Trump and Putin reportedly butted heads. “If you want to have an arms race, we can do that, but I’ll win,” Trump told him, according to NBC. Putin said in his address that Russia was working on more and more-varied nuclear weapon delivery systems than the US. Trump has also planned a few new nuclear weapons for the US, but they show a very different philosophy. While Putin described working on a weapon experts have called a “doomsday device” that would render large swaths of the world uninhabitable for decades, Trump’s nuclear posture review put forth the idea of building smaller nuclear warheads – with the idea that smaller nukes would be easier to use and less likely to start a massive escalation. 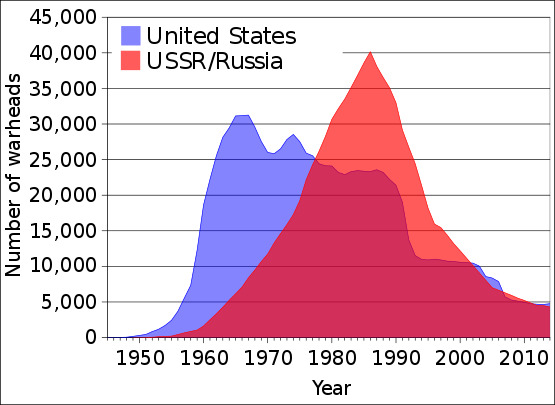 Wikimedia Commons User: FastfissionNuclear weapons stockpiles and inventories of the US and the Soviet Union/Russia from 1945 to 2006. In saying he would not allow anyone to match the US’s nuclear might, Trump may have unknowingly articulated just how arms races spiral out of control. Because Trump won’t allow Russia to catch up with the US’s nuclear might, and Russia feels the same way, the two sides seem destined to continue building up arms. But arms races have come and gone before. At the height of the Cold War, for instance, the US alone had 30,000 nuclear weapons, with Russia holding a similar number. As the Soviet Union collapsed and a climate of reconciliation allowed for arms control, that number dropped down to today’s total of approximately 6,800 nuclear weapons in the US and 7,000 in Russia. But even with today’s limited stockpiles, the US or Russia could single-handedly destroy almost all life on earth. The risk of miscalculation runs high, and even the best-maintained nuclear-arsenal is prone to accidents.